Writerly Ramblings: Wonderland Blog Hop & Giveaways! Wonderland Blog Hop & Giveaways! Thanks to all the people who stopped by my blog and hopped around to the other blogs! Welcome to the Crimson Wonderland Blog Hop! We have lots of great authors and giveaways! The authors at Crimson Romance offer a wonderland of romantic worlds! 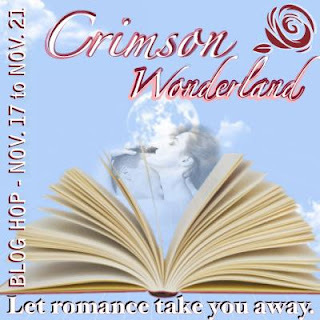 We’re celebrating our wide spectrum of romances with the first Crimson Wonderland Blog Hop! Forty-five authors will entice you to their worlds and offer prizes to lucky visitors. As well as dozens of giveaways, there will be three grand prizes: one gift certificate for $100 and two gift certificates for $50 each at Amazon or Barnes & Noble (winner's choice)! Every blog comment you leave during the hop is entered into a drawing to win one of the grand prizes.The more comments you leave from blog to blog, the more chances you have to win! Keep reading below for details on my own giveaways! It’s easy to visit each author. Click on their links at the end of this post. You won’t want to miss any of these fabulous authors, so be sure to follow each blogger. Let the romance take you away into a wonderland of fun with us! Read onward! You can come to paradise, but you might never leave... Explore my paradise for your next winter wonderland getaway! When I set out to write my fantasy romance novel, WICKED PARADISE, I wanted to write a time-travel with a heroine from medieval times and a hero from the present-day. I wanted an escape to an unknown, exotic, and unique world. A place Morgan and Ryan never wanted to leave. A place devoid of human life where they could explore their relationship away from the burdens of their horrible home lives. During the conception stage of WICKED PARADISE, I took a queue from a classic Eagles song, “Hotel California.” The lyrics: “this could be heaven or this could be hell” and “you can check-out anytime you like, but you can never leave” resonated with me. Instantly, the idea about an unchartered, inescapable island and the lost and desperate people who were destined to colonize it took flight. Most of all, I wanted my world to be the heaven they never wished to leave. First, I had to make it hell. What fun would heaven be without a trip through danger or hardship to reach that paradise? LOL! Due to my small cast of characters, my unique setting became an empathetic character itself and caused havoc and mayhem on my heroine and hero as they searched for their happily ever after. Just like my human characters, my world had to be friendly, to create mood and influence behaviors. Weather, treacherous terrain and non-human inhabitants needed to test the mettle of both my island and characters, and also create opportunities for my heroine and hero to come together and explore their relationship naturally as they traveled toward their common goal. As my characters evolved and changed, so did my world. My island showed fear and relief. It sought comfort as well as gave it. It worked with my heroine and fought my villain. It endured and overcame external conflict and peril. My island became real to me as if I had walked upon it a million times. Two moons shadowed the island and bathed the nights in violet hues. The sun hung in a cloudless blue sky. Fine white beaches, waterfalls, mysterious crystal caves and a hidden grotto beguiled my characters. The jungle cooled as well as sweltered, and it hampered as well as aided. Throughout the boundless evil Morgan and Ryan faced, they fell in love on my paradise away from the dying and apocalyptic lives they endured in their home lands and time periods. Shadowmoon Island became their destiny in more ways than one. Take a chance on a total escape for a couple of hours. Walk through my jungle, breathe its air, taste its food, experience a slice of heaven. Come to my paradise, and you just may find you never want to leave. 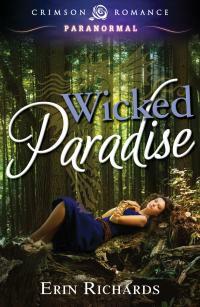 Click here to read more about WICKED PARADISE. What’s your idea of a winter wonderland? Where will you take your next vacation? Comment in this post for your chance to win an autographed copy of my romantic suspense novel CHASING SHADOWS, an autographed WICKED PARADISE postcard, bookmarks and a deck of Ellora’s Cave playing cards, which includes a card for CHASING SHADOWS! (US & Canada winner only; winner outside the U.S. or Canada will receive a $15 gift card to either Amazon or B&N, winner’s choice). Follow my Blog as I venture into Blog Tour Hosting and continue my own journey as a published author. Anyone who follows my blog during the Crimson Wonderland Blog Hop will earn a chance to win one of 3 eBook copies of CHASING SHADOWS.